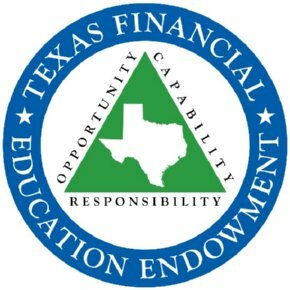 Effective January 1, 2012, the 82nd Legislature enacted The Texas Financial Education Endowment (TFEE) to be administered by the Finance Commission to support statewide financial capability and consumer credit building activities and programs. Sec. 393.628. Texas Finance Code. TEXAS FINANCIAL EDUCATION ENDOWMENT. (a) As part of the licensing fee and procedures described under this subchapter, each credit access business or license holder shall pay to the commissioner an annual assessment to improve consumer credit, financial education, and asset-building opportunities in this state. Financial Capability is a set of consumer behaviors that lead to long-term, tangible improvements in financial health. The TFEE Grant Program welcomes funding requests from organizations that strive to increase and promote financial capability of individuals, encouraging personal financial education and responsibility within the state of Texas. For more information about the OCCC's credit education program, or the TFEE Grant Program, please contact the Consumer Education Department at 512.936.7639 or via e-mail. If you have questions about credit education or would like a presentation for your group, contact OCCC: (512) 936-7639 or via e-mail. Call the consumer assistance helpline at (800) 538-1579 or send the OCCC an e-mail.